In my view, espresso is the greatest representation of coffee on the planet. I do enjoy a cup of French Press coffee each and every day but when I crave pure coffee taste, I brew up a batch of stovetop espresso or at times referred to as Moka pot or stovetop percolator. True espresso aficionados head for a coffee bar or own their own equipment, but I can’t justify both the cost of a high end espresso machine nor the daily expense of buying from a bar or café. 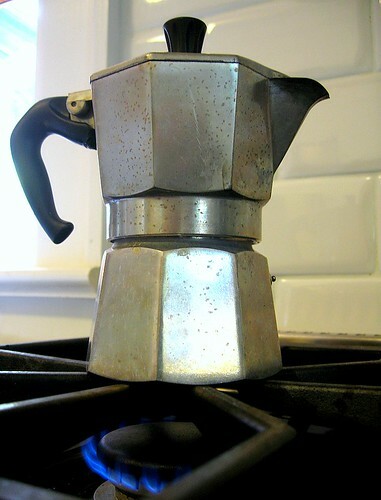 In turn, I’ve been using a 4 cup Bialetti stovetop espresso maker since my college days. The stovetop machine is inexpensive (about $25.00) and produces a good cup of espresso or cafe (it’s not a true representation of espresso but it’s just fine given time to brew, cost, and clean up). Unscrew the top portion of the espresso maker from the bottom portion and remove the metal filter/coffee ground holder. Fill the bottom of the unit with fresh, filtered, water (to the top of the bolt on the inside of the base). Fill the metal filter with ground espresso, making sure not to pack the ground coffee but simply filling the filter with enough ground coffee where a small mound is produced. Insert the metal filter into the base and tightly screw the top unit to the bottom portion of the maker. Place the maker on your stovetop and set on a low burn (it’s important not to use a high flame as you don’t want to boil the coffee). You’ll begin to hear the espresso come up in about 8-12 minutes depending on the size of the Bialetti unit you’ve purchased. And you’ll know that the espresso is done when no more espresso is coming out of the top unit (simply open the hatch and have a look inside). I like to turn off the stove about 80 percent through the brew as the residual heat will finish bringing up the rest of the coffee; if you keep the flame on your pot you run the risk of over boiling / burning your coffee. Stir the espresso in the maker before serving. A note on espresso beans: like any type of coffee preparation the fresher the bean the better tasting your coffee will be. So, you can buy beans and grind them per use, but it can be a labor intensive and messy affair (espresso beans need to be ground very fine). If you’re going to go the “grind every day method”, you’ll need a high end burr grinder. And remember there is no such thing as an espresso bean, just regular coffee beans that are dark roasted and ground very fine. While we’re big advocates of home roasting and grinding prior to brewing coffee we do keep some pre-ground espresso from Illy or Kimbo in the house. After all, espresso is meant to be a “quick” cup of coffee and not a labor intensive process. I bought one of these machines (Germans call them Moka) years ago and after some brief use it went into permanent basement storage. The problem? Absolutely no crema! My grandmother threw triple-ground espresso coffee into a (never washed) pan of boiling water, let it steep, and strained it into cups. This is identical to Cuban coffee, Turkish coffee, Arab coffee and Greek coffee. Some like it sweetened in the pan, but for good old paisano espresso (with crema), just treat it like machine-brewed espresso. Yes, the stove top stuff is not true espresso (with crema). Rather, stovetop espresso is more akin to a stronger cup of drip style coffee. Proper espresso can only be made with the right equipment, coffee bean and grind, etc. Synthroid court claims. Synthroid. Generic synthroid. Synthroid side effects. Synthroid without a prescription. Drug synthroid.